Vertical baling presses are specially designed to help you take control of your daily recycling of waste paper, card, carton boxes and plastics. These hydraulic bales are bound with hard steel wire to handle soft and rebounding nature of the paper stock. A high galvanized or annealed wire with a rust inhibitive coating is used for binding. 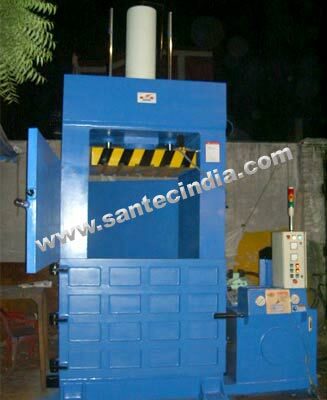 In Santec vertical Balers  The bales are tied with steel wire or plastic ropes which manually slots in the pressing block. This allows the wire to easily pass through the material. Chain-lever arrangement is provided at the bottom to facilitate ejection of the bundle / bale when cylinder moves upward.